Microblading of the eyebrows is a form of semi-permanent makeup. 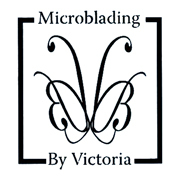 Here at Beauty by Victoria, we call the procedure “The Embroidered Eyebrow”. Each individual hair stroke is applied to the eyebrow to create a sophisticated and natural eyebrow to suit your individual needs. The procedure is mainly for clients who want to achieve a natural look and the end results are adjusted to suit your hair, skin colour and the shape of your existing eyebrows.